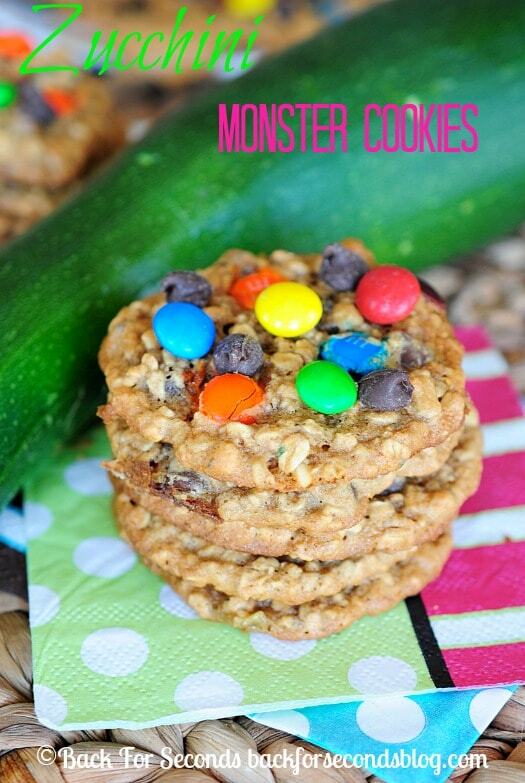 Zucchini Monster Cookies are a super delicious way to use up extra zucchini from the garden! You would never know these are made with zucchini and no butter!! Never miss a recipe – follow Back For Seconds on Bloglovin! You know about monster cookies, right? 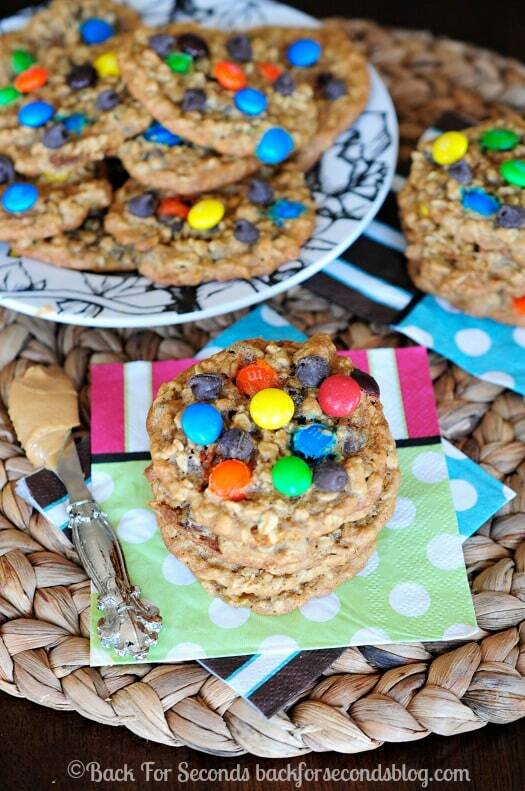 Basically they are oatmeal cookies loaded with all things good! We are a family of cookie monsters and I know so many of you are up to your necks in zucchini right now, so I thought it would be really fun to make cookies with zucchini! Believe me, even if you hate zucchini, you will still love theses cookies! You can’t taste it at all. My 3 older kids (5, 2, and 2) helped me make these cookies. I set out all the ingredients on the counter and my daughter (5) flipped out. Do NOT put zucchini in these. I don’t like zucchini!! I promised her that she would love these cookies despite the fact that they were made with zucchini. She decided to be brave and go along with my crazy idea. Since we were adding a vegetable to these monster cookies, I figured I should try to make them slightly healthier by eliminating the butter as well. Then I crossed my fingers as the cookies baked. Oh my goodness, you guys! These came out so so good! I honestly mean it when I tell you you would NEVER guess these are made with zucchini and NO butter! They are slightly crisp on the outside with a soft, chewy middle. 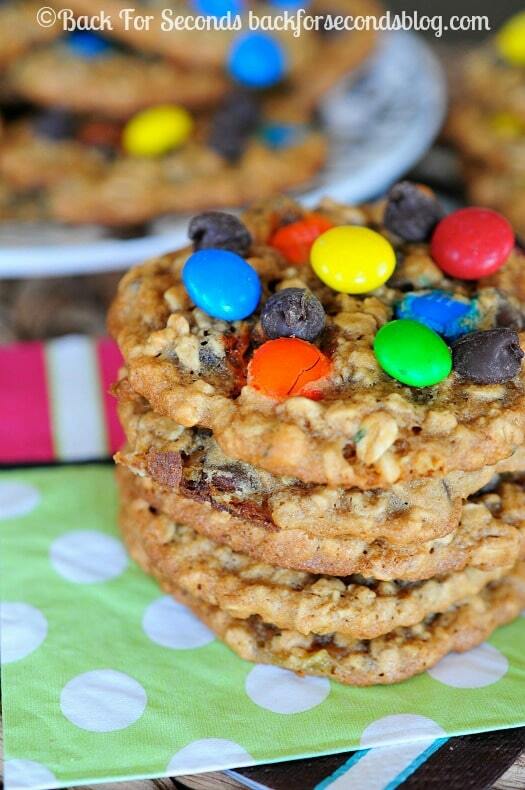 I might forever make my monster cookies this way! I shared with a few neighbors and they agreed, these cookies are amazing! what an interesting recipe idea to add zucchini!… definitely curious as to what it tastes like! Zucchini IN my cookies? Heck yes! These already blew up on my Pinterest – thanks! Can’t wait to try them! Love that you sneak veggies into dessert! 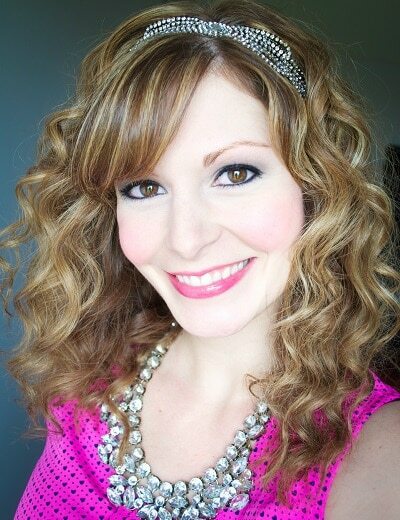 Oh my gosh Stephanie! BEST cookies EVER! What a fantastic cookie. 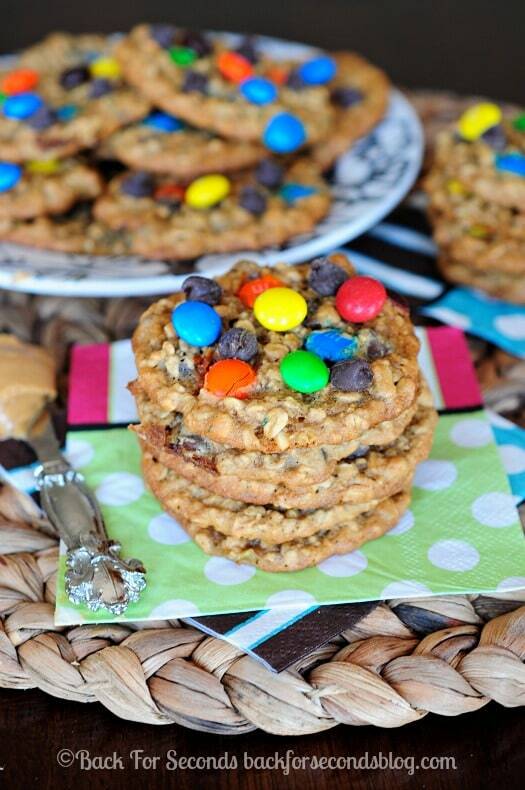 You’ve added all my favorite cookie ingredients including healthy zucchini! Making these right now!! Did I miss the oven temp somewhere? So sorry! I just fixed the recipe – 350* We just finished a batch and I can’t wait to make them again. Hope you enjoy! 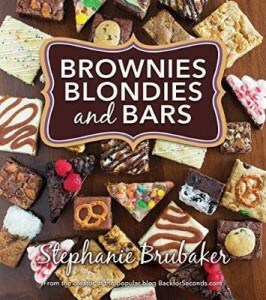 These are going to be made ASAP! All I need to do is pick up the MM’s. When I make them I’ll add a link back to you. One of the best ways to sneak some vegetables to childrens’ diet! Thanks for coming and linking up at The Weekend Social. All posts get pinned in our pinterest board! Please be sure to come back next week starting Thursdays at 9PM EST on culinaryflavors.gr ! I hope to see you there! I have an enormous zucchini and these look so good. Thanks for sharing a fun way to use it. Pinning.